Voici une photo prise durant l'exercice JTFEX de l'US Navy au-quel SNCMG1 participe cette semaine. 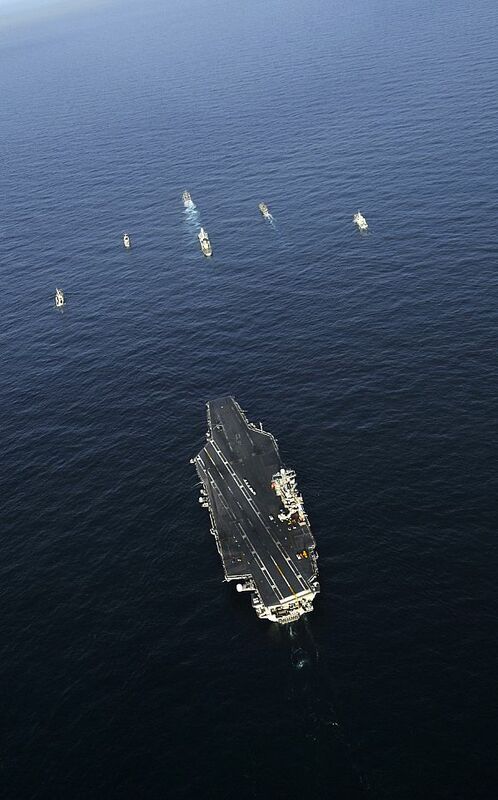 ATLANTIC OCEAN (Sept. 17, 2009) The aircraft carrier USS Harry S. Truman (CVN 75), BNS Liberal (F 43) from Brazil and HNLMS Van Speijk (F 828) from the Netherlands transit in formation during a group sail. 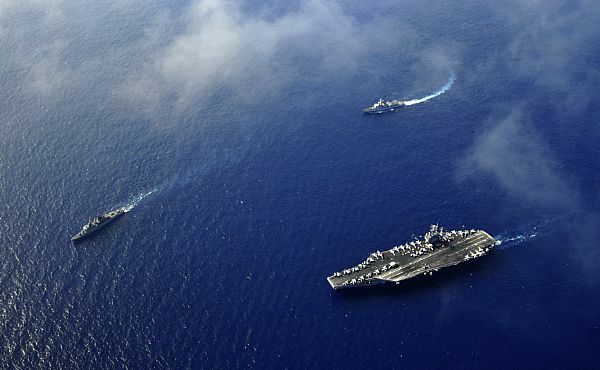 Harry S. Truman is underway participating in Joint Task Force Exercise. Non Le Lobelia ne participe pas, il est à quai. Wait and see! On sait où il est à quai exactement ? Histoire de rechercher d'éventulles news sur le web ! Le Lobelia bouge demain, mercredi 23. Pq c'est si important que personne ne peut savoir? Standing NATO Mine Countermeasures Group 1 (SNMCMG1) is currently operating along the east coast of North America. The group, consisting of mine hunters and a mine sweeper from 6 different nations, are all busy conducting exercises in support of larger combatants like the USS HARRY S TRUMAN Carrier Strike Group, that are being certified for operations through the Joint Task Force exercise – JTFEX 04-9. During the JTFEX the mine hunters and mine sweeper of SNMCMG1 have conducted mine clearance operations in a simulated strait in order to reduce the risk from mines to the Carrier Strike Group. For the past 9 days, sonar’s, under water drones, divers and sweeping gear have been intensively used, operating 24 hours a day. Our efforts have resulted in 15 exercise mines being located and countermined, which is simulated by their recovery; meaning that the mines can be used again for future exercises. By clearing the simulated strait, SNMCMG1 managed to reduce the risk from mines to an acceptable level for the Carrier and her escorts. 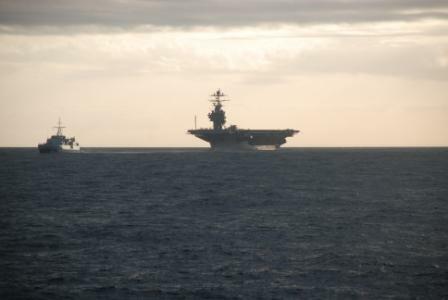 Having satisfied the Admirals requirements the USS HARRY S TRUMAN was safely escorted along a cleared route, through the mine field, in the early hours of 22 September 2009. From the outset, members of SNMCMG1 Staff established a Subject Matter Expert liaison team within the American exercise control facility ashore in Norfolk. Towards the end of the exercise the team relocated to USS HARRY S TRUMAN in order to provide timely advice to the Admiral on the progress of the mine clearance operations and, more importantly, the possible risk to the Carrier transiting the simulated strait. The hard work and effort did pay off and the Norwegian mine sweeper HNOMS RAUMA was tasked to conduct a traditional Lead Through operation, leading the Carrier safely along the cleared route through the minefield. It was evidently clear to all involved that without the support of SNMCMG1 the Carrier Strike Group would not have been able to transit this simulated strait. SNMCMG1 were acknowledged as a massive enabler in this exercise and praised for their professional conduct and their ability to integrate and support the Joint Commanders’ intent. The US Navy leadership recognised the effort and ability of SNMCMG1 as an example to follow, the ability to conduct naval mine clearance proved, for this scenario, to be mission essential. We, as ever, remain quietly calm over our achievements. We believe we only did what we do best, which is make the Seas a Safer Place, although this time in support of a Carrier Strike Group. 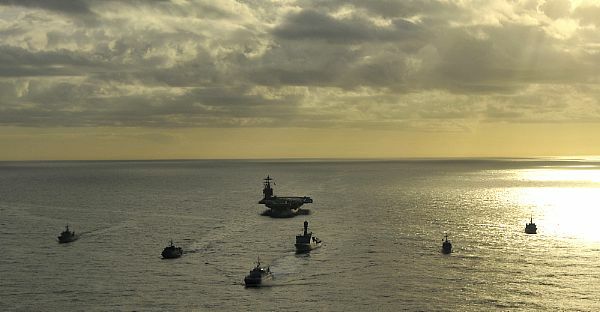 Voici deux photos (prisent durant l'exercice JTFEX de l'US Navy) avec les bâtiments de SNCMG1 qui ouvrent la route pour le porte-avions USS Harry S. Truman (CVN 75). ATLANTIC OCEAN (Sept. 21, 2009) The aircraft carrier USS Harry S. Truman (CVN 75) and ships from participating nations take part in a NATO mine countermeasures exercise upon the completion of Joint Task Force Exercise (JTFX). JTFX is a scenario-driven tactical exercise supporting major combat operations for the Harry S. Truman Strike Group. The exercise provides training for the strike group to proceed into a Fleet Synthetic Training - Joint (FST-J) exercise for final deployment certification. En plus du Lobelia, il manque un autre bâtiment de SNCMG1 sur les photos !? Les 2 chasseurs de mines canadiens sont là, le flagship HMDS Thetis est là, le norvégien HNOMS Rauma est là, le britannique HMS Quorn est là, et il n'y a qu'un CMT sur les photos ! Alors, soit c'est le holandais HNLMS URK qui est absent ou alors c'est l'estonien ENS Sakala, mais pour quel raison ? En attendant d'avoir des news du Lobelia voici une petite vidéo du M921 dans le Golfe de Gascogne au mois de février 2009.